An in-depth look at late 1970s/early 1980s mixed-race Johannesburg punk band National Wake's only album, which has now been re-issued. It was the latter atmosphere in which the South African punk band National Wake arose. Thirty years ago they released their eponymous album. Now, in the wake of the documentary Punk in Africa, they have remastered it and re-released it. They combined folk and Southern African music with soul and funk in a punk matrix, creating something wildly experimental, yet somehow inevitable. They played the alt club circuit and the township circuit, neither one of which was common for a biracial band, which was not common either, to put it mildly. Their only album, National Wake was released in 1981. It did not get great penetration internationally, given the difficulty of making music in a multiracial band at the time in that place. 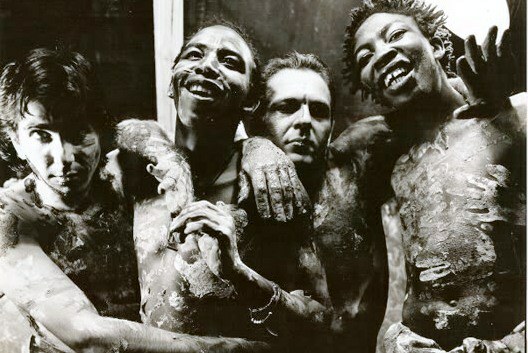 The racial element made it hard to play without harassment and the growing isolation of South Africa made international touring essentially impossible. And that's a shame, because the record is a whole new world for most, a world worth moving in. Any review that talks about one band in terms of another is unfair. It's misleading. It doesn't mean this review wont touch on similar groups, just that it is insufficient. National Wake sounds like no one so much as National Wake. Listening to the album (the album, not the songs — “I don't hear a single here!” and neither will you) is to enter a unique musical space, a refreshing one at times and at other times challenging. But it is its own thing.